Netflix is the world’s leading provider of subscription service to facilitate and simplify watching TV episodes and movies on phone or other similar devices. This excellent feature of Netflix can be downloaded on Amazon Kindle Fire as a mobile application that can be activated and accessed wherever and whenever. To get the application for free you need to register yourself as part of Netflix membership and then you will be immediately able to watch hundreds of TV episodes and movies just on your screen. For a non-member of Netflix member, you will usually be given one-month trial after signing up, to see the excellent feature of this app. Netflix is currently available and accessible for almost all viewers in the worldwide. In 2009, Netflix had offered over 100,000 titles DVD collection and had surpassed 10 million subscribers. In 2014, Netflix already has subscribers in over 40 countries and still intends to enlarge their services by promoting to unreached countries. Netflix had also been supported by software with particular requirements, such as OS X, Microsoft Windows, Linux, Android version 2.2 and up, Google Chrome OS, iOS, Windows Media Center, Windows 7, Windows 8, and Windows Phone. You will automatically get a new updated episode, as it will be added routinely. 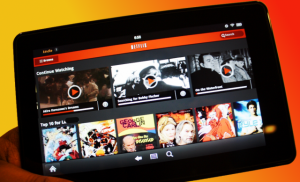 Kindle Fire is currently supported by Netflix in all regions. The requirements of screen resolution should at least support streaming for 480 pixels, with HD symbol and Internet connection is higher than 5 megabyte per seconds. Kindle Fire HDX 8.9 also allows you to set up Netflix HD playback. You need to tap the configuration bubble on top the screen for alternative subtitle and audio in the playback. To set up Netflix on your device, you have to connect your Kindle Fire to your Netflix account. Below are the steps you need to follow.